When you work with graphics, you need to have precise control over the colors that you use, which is why color picking apps were invented. But as image resolutions have gotten higher and higher, it’s gotten incredibly difficult to zero in on exactly the pixel that you want to mimic! That’s why you need to pick up today’s discount software promotion, ColorPic! ColorPic is a color picker with a magnifying function, letting you pick any color out of high resolution images, even on 4K monitors. With ColorPic, you’ll be able to grab palettes of as many as 16 colors as once, plus use four advanced color mixers to access a broad spectrum of possibilities. It’s simply the best solution for precise color picking for Adobe Photoshop, Firefox, Internet Explorer, and any other application. 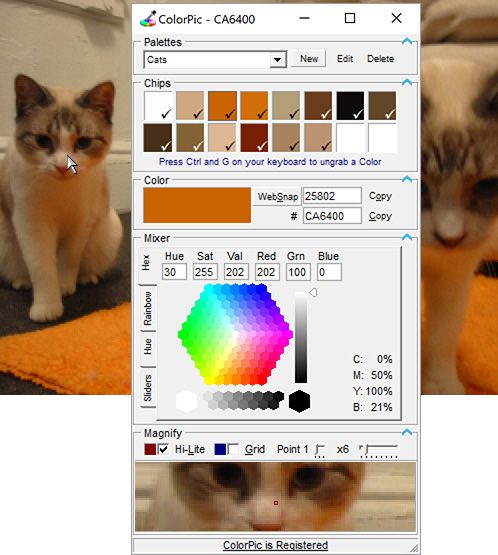 All of the technical features of a great color picker are here in ColorPic. View colors in hex and decimal, adjust Hue/Saturation/Value/RGB values, and view the Cyan, Magenta, Yellow, and Black percentages. Resize the magnification area to suit your needs. For web developers, you’ll appreciate the ability to snap to the nearest WebSafe color! Best of all, you can use the arrow keys on your keyboard to nudge your cursor, allowing you to target even the finest detail on high resolution images! After you purchase ColorPic it may be used indefinitely. ColorPic is licensed per computer, and not per user. Nelson Therrien Wasn’t that free product? It’s paid since version 5? What are the differences between 4 and 5? Nico Westerdale Great News! Iconico, Inc. has agreed to extend this deal for another day - Enjoy!